Serena Hotel offered me a free stay, food, and spa treatments in exchange for this review. Ah Serena Hotel… I’ve loved you since we first met! Well actually, that’s a lie. The first time we met in 2010, I asked about your price for a day pass to the gym and I was told a whopping $30. I then left in a huff due to not being able to afford such luxuries. But I was able to look past that first encounter and truly fell in love with I discovered the affordable annual rate for the gym and pool. Fast forward eight years and I’ve been in touch with their lovely marketing manager about staying for a couple of days in exchange for a review. I’ve already reviewed the Kigali Marriott Hotel, Radisson Blu, and The Retreat and Serena Hotel is the the last piece of the premium hotel puzzle here in Kigali, so I was on board! Unlike the other hotels, I was already very familiar with Serena. I’ve spent countless hours at their gym and pool, eaten plenty of meals, and got to know many of their staff. I’ve always been a fan and I was excited to see what a stay here would be like. Unsurprisingly, it was pretty glorious. I stayed in one of their Prime rooms with a balcony overlooking the pool, a crazy huge bed, a zillion pillows (give or take), a giant desk, a comfy loveseat, a coffee maker and kettle, and a TV. The bathroom was equipped with two sinks, a waterfall shower, and even a bath. As I write this I’m super bummed that I didn’t make time to have a bath but oh well… live and learn! After an early check-in, I headed down to their Sunday buffet. They have a buffet every day for breakfast and lunch but their Sunday buffet (Rwf 25,000 with fresh juice and pop) is their prime food attraction with a huge spread of food and options to make it boozy (Rwf 32,000 with bottomless bubbly, local beer, and house wine, and Rwf 45,000 with bottomless champagne). It runs from 11:30am to 4pm, with entertainment. They’ve got a huge selection of bread and pastry (including gluten free), about 20 different options for hot dishes, a selection of salad stuff and cold items including sushi, a bunch of different types of cheese, fresh juice, and a massive dessert section. It’s pretty epic. I spent my first night chilling in the hotel room being boring and catching up on website work. Their wifi was flawless and fast and the desk was a great place to spread out, settle in, and get some work done for the evening. At some point, a knock came on my door with a couple of staff members offering ‘turn down service’. I’m really not a fancy person and I had to ask what it is. The reply was something to do with cushions and curtains and making the room ready to sleep in. I couldn’t resist the inviting bed and had already had an epic nap, so the place was sort of disheveled with pillows stacked on a table and cushions flung to the other side to make room. I was wondering how a person could find space to sleep among all of the pillows and the answer is – turn down service. The cushions were whisked away, my curtains were drawn, slippers appeared, water and a glass was put on the table beside the bed, and the room was now ready for sleeping. Turn down service… who knew? The breakfast buffet (Rwf 19,500) at Serena Hotel has long been on the radar of Kigali residents. Back in 2010 when I first arrived it was one of the very few (or maybe even the only) options for treating yourself to a nice breakfast in Kigali. I definitely splashed out a few times on this buffet and it remains as good as always. As with the Sunday brunch, there are about 20 options for hot food ranging from scrambled eggs to rice and beans to sausage and bacon and even to masala paneer and naan bread (which was delicious). They’ve got a good selection of cereal, loads of bread, an omelette bar, yoghurt with all of the expected toppings, and loads more. It’s still worth it as an outsider treating yourself to breakfast and as a guest of the hotel, it’s a great start to the day. One of the things about Serena that would sometimes let me down was their restaurant, Sokoni. I’ve had a few disappointments there in the past including ‘Parmasan cheese’ with zero taste and chicken wings with a fishy aftertaste. I had a few meals that I could always count on (like the steak sandwich and fish and chips) but I’d never been super excited about eating here. Well I think something has changed over the past couple of years because their food got good, yo! I had a few wonderful meals courtesy of room service (might as well be fancy while I have the chance, eh?) including one of the best steaks I’ve had in Kigali. It was perfectly cooked fillet steak (Rwf 15,000) with a generous serving of peppercorn sauce that was enough to also slather the mashed potatoes. The veggies on the side were cooked but still a bit crunchy and felt like they added that healthy element to the dish. It was a huge serving and I was really impressed. For me, the best thing about Serena has always been their swimming pool. I think it’s the most chilled, relaxing spot in the city, especially if you go midweek. During my seven years in Kigali, an annual membership at Serena’s gym and pool was my guilty splurge to myself. But given the amount of time I spent there either at the gym, lounging by the pool, swimming, or even parked with my laptop working in the balcony above the pool, it was money very well spent. At $40 for a day pass (including the pool, gym, and spa) the Serena is probably reserved for very special occasions but if you live nearby, have a flexible job, enjoy soaking up Kigali sunshine, and would use the membership regularly then I can recommend a longer membership for sure. You also get access to the hot tub, sauna, and steam room and to the only gym changing room in the world that actually smells nice. In addition, Maisha also offers various types of deep tissue massages from Rwf 53,000 for 60 minutes up to Rwf 82,000 for 90 minutes. Also offer Swedish massage (Rwf 45,000 for 60 minutes), hot stone therapy (Rwf 52,000 for 60 minutes), and a variety of other 30 minute massages from face and scalp, neck, head, and shoulder, and foot pressure (Rwf 33,000 each). Various facials are available either for 30 or 70 minutes ranging in price from Rwf 43,000 to Rwf 95,000. Men’s treatments, pregnancy massage, various body scrubs, detox wraps, and body waxing are also all on offer here. It’s a place where you can pretty much find any treatment you’re looking for. I was offered the Elemis Coconut Rub and Milk Ritual Wrap (46,000 for 45 minutes) which was something I’ve never tried before. I got a full body scrub and was then wrapped up in some sort of sheet for about 30 minutes. It was weird and wonderful all at the same time. After a quick rinse off I was back at it with a one hour Swedish massage (Rwf 45,000) which was perfect. I’ve never really been so into massages (chalk it up to too many strange previous experiences… including one massage in China ending with the masseuse licking is finger and sticking it in my ear – a ‘wet willy’… true story) but I’ve been coming around these past few years. I’ve learned that I don’t like deep tissue massages so much because I often come out in more pain than I went in, but I’m big into the less aggressive Swedish massages and this one was just the right amount of pressure and very relaxing. Despite being Kigali’s oldest premium hotel, the Serena still shines. They’re an East African company and have many years of experience doing business on the African continent. They pride themselves on this and go the extra mile to add little reminders that they’re African. Within each country they operate, you’ll find unique design features. 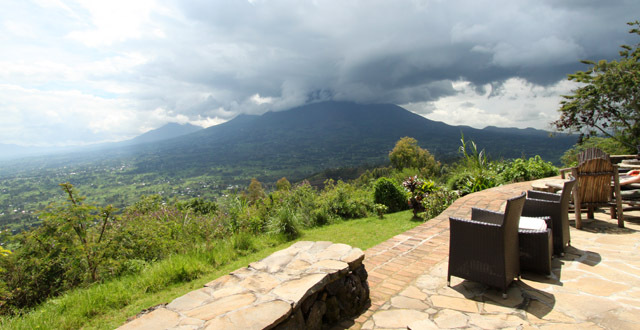 In Rwanda you’ll see lots of waves and ‘hills’ all over the hotel if you know what to look for. They have the walls adorned with Rwandan art, and the places feels full of warmth, rather than being too slick and corporate. As stay at Serena Hotel isn’t cheap (check their website for rates) and I’d love to see them offer cheaper local rates like you can find at Kigali Marriott. But if you can afford it or if you have special guests coming to town who can, I would recommend you give the Serena a look. At the very least, pop by and try some of their food or splash out and enjoy a day at their pool and gym.